I am so excited to share with you one of the newest VeggieTales DVD's: God Loves You Very Much! This fun and family friendly film features stories that demonstrate how God cares for us in all kinds of situations! VeggieTales: God Loves You Very Much is the follow-up title to the smash-hit VeggieTales DVD, God Made You Special. VeggieTales is the favorite genre of movie in my house with my son! He literally asks to watch a VeggieTales movie everyday! And of course, he LOVED it! It has all his favorite characters in it and, best of all, it includes FOUR different stories in the one DVD! It is great for when I only want him to watch a short story! Best of all, it gives an amazing message: that God cares for us!! Buy It: You can purchase God Loves You Very Much for $12.93 wherever DVDs are sold. 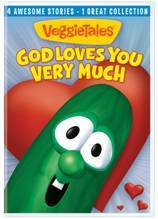 Win It: VeggieTales is generously offering (1) God Loves You Very Much DVD to a lucky winner! I am a follower of the Review Stew! Great giveaway! Very cool! Thanks! And thanks for joining the Google + hop this week! I have a twitter hop and a Pinterest hop going on right now, too if you're interested!